Not only is Dan an extremely talented musician, but he’s skilled at teaching in a way that is fun for our kids. "We feel so lucky to have found such a wonderful music teacher as Dan for our kids. Both our son and daughter take guitar lessons from him and have both thrived and grown in their playing and confidence under Dan’s guidance. Not only is Dan an extremely talented musician, but he’s skilled at teaching in a way that is fun for our kids. They enjoy jamming with him and the way he encourages their own abilities to use their musical instincts to improvise and create. We first came to Dan as a teacher and now count him as a friend because he’s so cool!" -Becca D.
There was never grumbling about practicing at home, because my children came home wanting to continue to explore a new song or chord that Dan introduced them to. Two of my children took music lessons from Dan McGuffin over a period of six years. THEY LOVED DAN! What we loved was that Dan fed and built upon their natural musical enjoyment and talents. He selected music that my preteen/ teenage kids enjoyed. 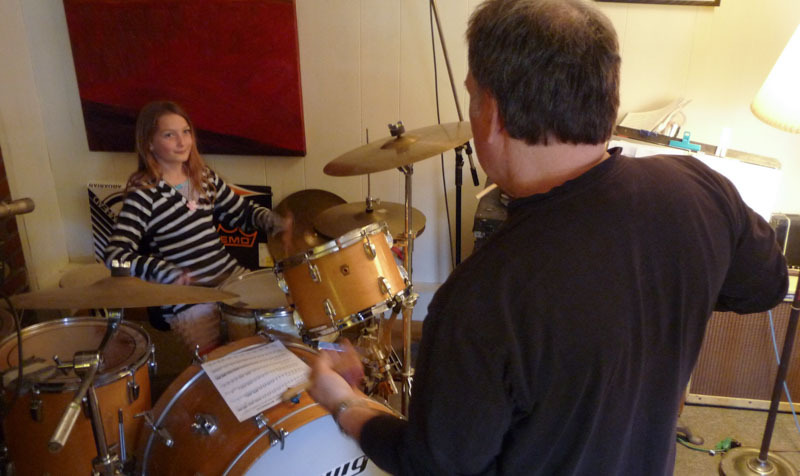 Dan also allowed my children to experiment with new instruments, throwing some “drum time” into my son’s guitar lesson. There was never grumbling about practicing at home, because my children came home wanting to continue to explore a new song or chord that Dan introduced them to. My son would even ask for extra time to go and play his guitar with Dan. Dan did the best kind of teaching, he simply “played” with my children while gently pushing them to develop more skills. With Dan’s modeling and enthusiasm, my children really had fun while Dan snuck in his excellent teaching! -Kelly M.
We absolutely love Dan and strongly recommend him! He is a truly fantastic teacher. He is very hands on, finds what excites my son, and is very encouraging. My son looks forward to his weekly lessons. When I asked my son what he loves about Dan, he said, "everything!" He is very flexible in terms of schedule if we have to cancel for some reason. His price is very reasonable. For a nominal fee, his wife Genevieve picks up our son from school. We feel incredibly fortunate to have found Dan. -Anne P.